Last week I was at the beach with my family. It was a bright sunny spring day. It felt good to sit under the umbrella and read. The comfort of the beach chair made me doze off a few times. Suddenly, I heard an unfamiliar voice call my name, “Urmila…Urmila…” I got up and explored around the beach. The voice had come from the direction of the sea. Without thinking further, I took a plunge in the water. It was cool and clear. The air above was fresh and crisp. Soon, I was swimming in the open sea. I enjoyed throwing my legs in a frog-like motion as my head bobbed in and out of the water. It seemed like the most natural thing to do. Each time I dove in, I could see numerous big and small colorful fish squirming through the waters. The fish presented such a beautiful sight, I wanted to watch them more closely. I tried to hold my breath longer inside the water. The gentle waves flapped all around me as if they cared. I never knew swimming was such fun. After a while I started to swim underwater. I went deeper and deeper and mingled with the fish. They were all around me. They eyes were round and startled. I knew they were inquiring, “Who are you ? Haven’t seen the like of you before.” I put a smile and tried to say, ” I am a human being from the land.” May be the words were muffled in the bubbles and sounded funny. Their questioning look changed into an half-amused friendly smile. “Welcome to the deep sea!” Saying that, they all darted in different directions away from me. Within a minute, I was by myself encompassed by blue waters. The water felt a little colder than before. In the pale light that penetrated from above, I saw shadows of larger fish approaching. It was a school of yellow-tailed tuna. This became apparent when hundreds of them appeared all around me. I waved my hands to catch their attention. Their mouths looked rueful, like the inverted letter U. Their eyes were focused ahead. They were on a mission and were not going to lose any time, getting distracted. They reminded me of the swarm of daily commuters getting out of the subway. I felt a little out of place. So I kept on diving deeper to avoid getting in their way. Deeper waters were even darker. It took me a while to get my bearings. It was however much quieter down here. I breathed a deep sigh. I liked the peace. The sound of the tunas hurrying away now faded away in a distance. Finally, I could enjoy on my own, away from the humdrum. After a while it seemed little too quiet. I felt a premonition of danger. In a few seconds, I heard a slight swish. A humongous shadow came out of nowhere and within a second I was only couple feet from a great white shark. It’s jaws were apart showing the jagged sharp teeth. I was dumbfounded. My hands and feet slumped and I started to slowly sink down. The shark was preoccupied with something else and did not notice me. It darted upwards with lightning speed after the myriads of tuna. I felt relieved at the narrow escape. By now, I must have sunk several hundred meters below the sea level. No sunlight was reaching here. I could not tell what time of the day it was. I felt I was floating in the night sky, studded with numerous specks of stars. The deep marine life floated around like luminescent patterns of various colors. I saw a school of jelly fish pulsating in a smooth wavy motion producing a soft blue glow. It presented the most soothing sight I had ever seen. All my fears melted away in a moment. I was engrossed in taking in the beauty of the surrounding. Out of the darkness, a swordfish moved in and grabbed a jelly fish. The defenseless prey, in a panic mode,suddenly started emitting its light in an on-off pattern almost like a siren to seek help. It was painful for me to watch this happening right before my eyes as I did not know how to help. As if to answer the jellyfish, from right beneath my legs billowed a giant squid. One of its huge tentacles lightly brushed the tip of my right toe. It was as if the helpless jellyfish had a secret ally that would take revenge on its predator. The squid was as big as a two story house. It was the largest sea creature I had ever seen. I moved back to get a better view. Swiftly, it wrapped around its suckers on the swordfish. The attacked swordfish released the jellyfish. I looked away at this point to avoid seeing the end of the swordfish. After sometime, the faint light from the jelly fish school receded away. I remained still like a carcass as the envelope of darkness descended all around. In the midst of it, I got an eerie feeling that the giant squid was watching me. For several minutes, I heard a slight flapping around my ears as if long flat bands were moving in the water, creating waves. I felt tired and numb. The gentle waves that floated by me had a calming effect. At the same time, I saw a tiny speck of light in the distance that made me forget everything and held me in a trance. The point of light became bigger and brighter. In the bright light, I saw a big open jaw with gigantic teeth waiting to sink into my eyes. I was face to face with the most bizarre marine life: an angler fish. But something pulled me down, just in time. Numerous giant suckers gripped my entire body. I was completely under the influence of a tremendous downward force. The grip was firm but not crushing. I knew it was the same squid taking me downwards. “Are giant squids even friendly? Are they like dolphins?” I wondered but quickly waved away the idea as being too optimistic. With the possibility of end being real, I remembered my family. They were at the beach. My mom was under the umbrella reading a book. My dad and brother were snorkeling near the shores. They might even be searching for me. “Do squids have a family ?”, I thought . After what seemed like an endless downward journey, I brushed past a rocky mound. The giant creature slid me through an opening in the rock into a big cave like shelter. My eye sight had grown more sensitive to the dark by now. A dim lighting was provided inside by bio-luminescent algae lining the cave walls. I detected swift movements on the ocean floor to my right. It was another giant squid. This giant squid was even bigger than the one carrying me in. I, immediately identified her as the mother. The two other squids in the cave were much smaller in size. The smallest one was only about the size of my dad. I could not believe my luck. I had just met a family of giant squids. The male squid that had carried me to the cave, released me on the floor. The baby squids came to him and nibbled at the food from his open beak. Mama came near me and lightly brushed her tentacles over my arms. I was ticklish but did not laugh as I thought it might be disrespectful. I could see one of her eyes, which was as big as my head, measuring me up, carefully. Two of her tentacles were much longer than her eight arms. However, one of her arms was much shorter. It must have been injured in a fight, recently. Finally, she went to Papa squid and shared the food from his mouth. I thought the parents may be taking turns to gather food for the family. After feeding, the baby squids came to inspect me. I felt brave and stretched out my hands. They mimicked me. Each tentacle had two rows of powerful suction cups. They use these to grip on to rocks or other prey. The characteristic of a giant squid is that the number of suckers are far more numerous than a normal squid. Suddenly, the giants looked scared and quickly darted to the farthest corner of the cave. I shivered seeing their reaction and turned my head towards the opening in the rock. By the feeble light of the glowing microorganisms, I saw a huge sperm whale moving in the water, coming towards the cave. It came very close but got stuck at the entrance of the squids’ hideout. The opening was too small for the whale. It moved away and came back several times. It was waiting for the squids came out at an opportune time. After repeated attempts, it finally gave up and swam away. Once at the surface , I popped my head up and gulped a big breath of fresh air. The beach was not too far away. I could see the umbrella looking like a small pin. 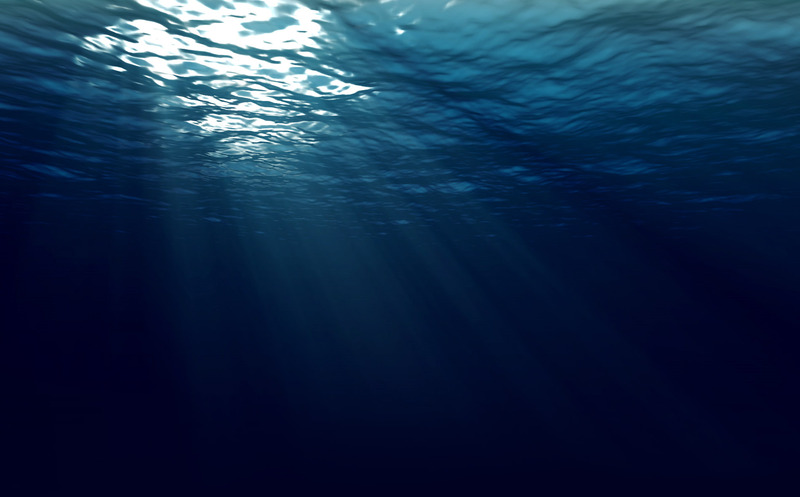 I started to swim to the shore eager to meet my family and tell them about my deep sea adventures. In my excitement I gulped some salty water and almost choked myself. I would have drowned if I had not woke up on time to save myself. My nap was over. I found myself beside my mom on the beach chair with the book “20,000 Leagues under the sea” over my chest.